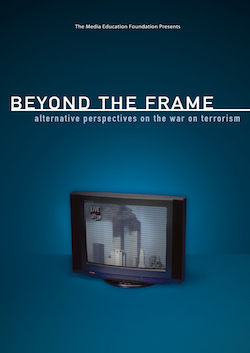 Launched in September 2001, Beyond the Frame is a series of interviews with leading scholars, experts, and activists offering alternative perspectives on the 9/11 tragedy and its aftermath. Originally a web-only project, it was a response to MEF's alarm at the dangerously restricted range of views presented by the mainstream media, largely confined to the opinions of political elites and a commercial frame dependent on advertisers and ratings. Featuring some of the most prominent names in political and social thought: Seth Ackerman, Belquis Ahmadi, Joan Blades, Maliha Chishti, Noam Chomsky, Jo Commerford, Kevin Danaher, Cynthia Enloe, Henry Giroux, Janine Jackson, Robert Jensen, Sut Jhally, Darryl Kimball, Michael Kimmel, Mhahsa Khanbabai, Naomi Klein, Manning Marable, Mark Crispin Miller, Bernie Sanders, Ritu Sharma, Vandana Shiva, and Alisa Solomon. Duration: 2 hrs 26 min. "A must for communications, modern world history, social studies, and journalism classrooms!"